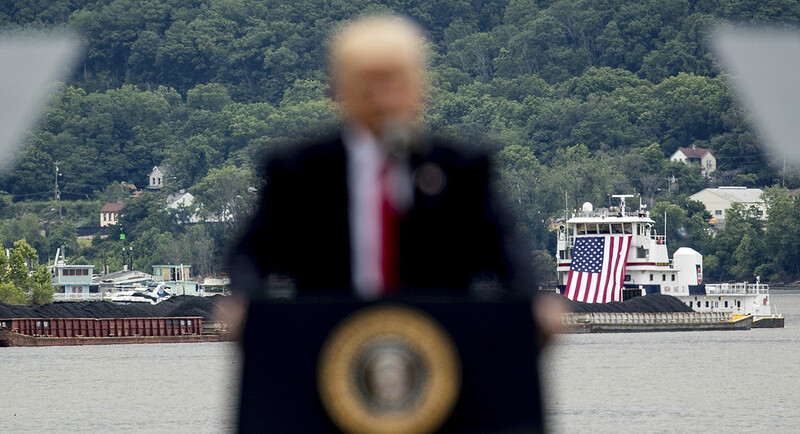 A coal barge is visible behind President Donald Trump, who spent his campaign promoting an "America First" energy policy that translated to more oil, gas and especially coal. Trump spent his campaign promoting an "America First" energy policy that translated to more oil, gas and especially coal — even as he slammed solar as expensive and hammered wind turbines as ugly. But after growing rapidly during the Obama years, wind and solar energy may have come too far for even a pro-fossil-fuel administration to stuff back into the barrel — especially after creating tens of thousands of jobs in both red and blue states. "I believe that the wish of the administration to generate again new jobs in old technologies is clearly determining their policy agenda, but that policy agenda has so far not been able to match up against the realities of the unrelenting pace of the energy transition," said Jules Kortenhorst, CEO of Rocky Mountain Institute, a clean energy advocacy group. The solar tariff, along with a trade case on washing machines, gave Trump his first opportunity to implement protectionist trade policies while targeting his preferred adversary, China. It also demonstrated the way such cases can split both political parties and the industry that the trade penalties would affect. Administration officials sold the solar tariffs, which were opposed by most of the domestic solar industry, as an effort to preserve national security. While Sen. Ron Wyden (D-Ore.), normally an environmentalist, wanted strong tariffs to protect his home-state manufacturer SolarWorld, Sens. Thom Tillis (R-N.C.) and Lindsey Graham (R-S.C.) both opposed the tariffs as potentially damaging to companies that make components for solar systems. "It was not as bad as we expected," Tillis said Tuesday of Monday's tariff decision. "We were glad that the extreme scenarios that were being floated didn’t occur. Now we’re just trying to figure out structurally how this really affects what has really become a very successful industry." The solar industry now employs 260,000 people and has become one of the fastest-growing energy sectors. Together, wind and solar power make up most of the new power capacity added to the U.S. grid in recent years. The Solar Energy Industries Association says the tariffs imposed Monday will cost the industry 23,000 jobs, but even CEO Abigail Ross Hopper said the 30 percent tariff was not as bad as it could have been, since Trump could have imposed a 50 percent tariff. "I think this administration really grappled with the understanding that solar is creating more jobs in this economy than many other industries and many other energy sources," Hopper told reporters. "This decision, while we’re not happy with it ... does demonstrate some restraint, understanding that this impact is going to affect jobs and growth in the U.S."
Since solar cells and panels make up only a fraction of a new solar system's costs, analysts expect the tariffs to bump up overall installed prices by 6 percent for residential rooftops and about 10 percent for utility-scale plants. Rocky Mountain Institute's own analysis says that the ongoing decline in solar installation costs will wipe out the price increases from the tariff in 18 months.